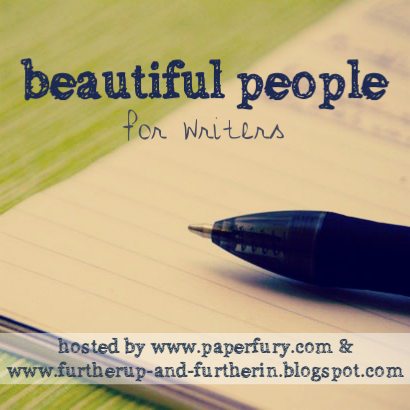 Since Cait and Sky are doing one last round of Beautiful Books for NaNoWriMo-ers, I’m diving into the Beautiful People archives again for a character questionnaire. I never plan ahead of time who I’ll cover in these posts – and when I saw the list of 10 questions you’re about to read, I immediately knew who would be the best fit. I haven’t said much about Prince Virikar (who more often goes by Virik) with the exception of a couple paragraphs here. It’s partly because he’s only a minor antagonist in my WIP, The Keeper’s Curse, and partly because I’ve been looking for an opportunity to get to know him better, especially since I’d like to write more about him in the future. My biggest concern with Virik is that I haven’t made him sympathetic enough; I don’t want him to be one-dimensional. So, if you have any feedback or additional questions after this post, please share them. I could really use the help! Some quick facts about Virik: He’s 23 years old, with red-streaked black hair and gray eyes. He’s also the oldest of two sons of the King of Fae – but as you’ll find out, that doesn’t mean he’s next in line for the throne. 1. What is Virik’s motive? If I’m interpreting this question correctly… Virik’s motive is to regain his father’s favor. Unfortunately I can’t divulge all the details for spoiler-ish reasons, and not everyone in Fae knows what really happened… but rumor has it that, when he was 11 years old, Virik had a hand in the death of his father’s top adviser. By Fae law, Virik should have been exiled and wing-stripped as punishment. His father, however, couldn’t bring himself to do that to his oldest son. So, he chose to “demote” Virik and elevate the younger son Milos to next-in-line for the throne, and had Virik groomed to take command of the Fae Royal Guard instead. He also gave orders for Virik to be kept under close watch at all times, in case he should try to harm Milos or other Fae in retaliation. So, Virik’s motivation for everything he does is for his father’s benefit. You could call it love or devotion, but he also clings to resentment and shame. He’s like the protagonist Eva in that regard, and can be a “hot-and-cold” character: respectful and obliging at one moment, cold and callous the next. It always depends on the situation and who else is involved. 2. What does he want, and what is he prepared to do to get it? What is Virik willing to do on a small scale? He agrees to anything his father asks of him, but voices his opinions when he believes something isn’t in his father’s best interests. He also volunteers his services whenever he thinks they’re warranted, even if the task isn’t in his “realm” as Commander of the Royal Guard. He’s not exactly the lying or manipulative type (hence the “for the most part” bit in the previous paragraph) – but he’s not afraid to intimidate or criticize others so they’ll do what he thinks they should. 3. How does he deal with conflict? Virik deals with conflict by being direct with other characters. He’s rational as well as stubborn, so he’ll tell you what he thinks and often without tact or considering your feelings. If he’s with his parents – especially the King – he tries to choose his words more carefully, but it doesn’t always work out. And if things get really out of hand, or if a situation doesn’t go his way, Virik will either blow up emotionally, or withdraw or fall silent to avoid an outburst. 4. Describe his current place of residence. If you’ve read past Beautiful People posts, you might remember that the Fae in TKC’s world live in “treehouse-style” dwellings called kagenden. However, it would be rather difficult for the Fae royal family to live in a treehouse-style palace that also accommodates their staff of servants, knights, etc. and offers a place for visiting dignitaries to stay. So, Virik and his family live in a castle known as the Rakmetha (roughly means “royal earth-bound house” in Fae). Built with light-colored stone, it’s more airy and open to the forest surroundings, and more sprawling than tall. It also has a massive, lush courtyard. Imagine an amalgam of the images in the collage below (which include three photos from the Bijolai Palace in India), and the Rakmetha looks something like that. 5. If he was writing The Keeper’s Curse, how would it end? Virik and the Royal Guard – not Eva and the Council of Selanaan – would have gone with the Mountain Folk to help them reclaim their ancestor’s relics. Simple as that! 6. What habits, speech patterns, etc. are unique to him? Again, Virik’s behavior is circumstantial. If he’s with people he likes or wants to please, he’ll lean forward, nod his head as he listens, and stand or sit with an open posture / body language. Otherwise, he crosses his arms over his chest; or if he’s sitting, he’ll lean back and prop his feet up on the table in front of him. How Virik speaks also depends on who he’s speaking to. He can be dignified and charming, or viperous and condescending. 7. How does Virik show love? What does he like to do with / for people he loves? Emotional intimacy isn’t one of Virik’s strengths. He’s not the kind who says “I love you” or shows gestures of love or affection. Instead, he shows his devotion to his family through his day-to-day actions. Ensuring all things within the Royal Guard are running smoothly, arriving to meetings or social events early, carrying out his tasks to the best of his ability – it might seem more like duty than love, but that’s how Virik feels most comfortable proving his love to others. This applies mainly to Virik’s parents. I wish I could say Virik gets along with his brother for harmony’s sake… but Virik would rather spit on the ground Milos walks on – or on Milos himself. Virik has a few friends, too. Not many, since he prioritizes his family above everyone else, but he likes a number of his high-ranking subordinates in the Royal Guard. So when he’s got time, he’ll scrimmage with them in a swordfight or hand to hand, take them on hunting trips, or invite them to social engagements he’s attending. 8. Does he have any pets? Like many Fae, Virik has two pets for specific purposes. He owns an all-black stallion named Anriam (Fae for “fastest”) for traveling when flight isn’t convenient; and a messenger robin called Somhonia (a combination of the Fae words for “faithful” and “reliable”) for delivering letters to other parts of the land. 9. Where does he go to relax or think? Virik finds it difficult to relax. Small wonder, considering all the anger pent up inside. However, he feels some semblance of calm when he’s with people he likes. He’s not a “party person” per se, but he enjoys a glass of wine and good conversation, regardless of how many people are there or whether the gathering is political or personal. (Though if Virik had to choose, he’d go for political over personal.) If he needs to be alone, he’ll retreat to an empty corner of the stables or the Royal Guards’ practice rooms and take out his frustrations on things. Trust me – if Virik wants to be alone, it’s best to let him be. That wraps up this month’s edition of Beautiful People. What do you think of Prince Virik now that you’ve “met” him? Does he seem like a believable antagonist? Hmm…you know, the whole time I read I kept thinking about Zuko from Avatar Airbender. They aren’t exactly alike but Zuko was denied his right to the throne and thus carries a chip on his shoulder because of it. It sorta seems like Virik has a chip there too. Zuko has a lot of dimension too, in case you want to check that anime for ideas. Virik sounds interesting though. Does he have a soft spot for someone or something other than his father? And why does his father’s approval matter so much? Does his father make him feel worthless? Or maybe it’s not his father’s approval he wants so much as the throne. Hmm…what would he do if he was offered the throne but didn’t need his father’s approval to get it? Ohhhh, thank you for these questions, Zezee! I’m sorry I haven’t said so sooner; I just needed to clear out time to give your comment the attention it deserves. “Does he have a soft spot for someone or something other than his father?” Yes, his mother. I need to spend more time considering their relationship (I haven’t done so only because Virik’s mother doesn’t appear in TKC), but Virik knows that his mother still loves him and will listen to him. This isn’t so obvious from his father, so having a bond with someone in his family (even though it’s complicated due to his past mistakes and their impact on his family) gives Virik some hope for redemption in his father’s eyes. “And why does his father’s approval matter so much?” Probably because family, or the concept of family, meant a lot to Virik when he was a child (at least, before the “incident” when he was 11). He wanted his father to be proud of him then, and he still does now. If you grow up with that belief, it’s hard to let go of it as you get older. Plus, Virik wants his “future king” right again; and he’s convinced that if he works hard enough and proves himself worthy to his father, he’ll be able to win it back. (Between you and me, though, that’s very unlikely….) So, it’s a weird mix of valuing his father’s opinion and wanting to achieve his goal. “Does his father make him feel worthless?” I’ll have to have a “talk” with Virik about this. If you check out my response to Shim’s comment below, that will tell you how Virik’s own father thinks and acts toward Virik. From Virik’s perspective…. part of me thinks his pride and ambition numbs him to his father’s rejection, but the other part of me knows there’s a wounded boy inside who wishes his father would think differently of him. “Hmm…what would he do if he was offered the throne but didn’t need his father’s approval to get it?” I think I’d need a scenario to help me answer this question. The only one I can think of is if someone offered to murder both Virik’s father and his brother Milos. In Virik’s mind, it would take care of part of the problem (Milos), but Virik is too loyal to his father to consider a deal like that. If he agreed to it and was made King afterwards, he’d feel guilty for not earning the rank in a more honorable way. Does that make sense? Oh, and Zuko / Avatar Airbender… I actually don’t watch that show (*blushes*), so the similarities between Zuko and Virik are coincidental. Again, an impressively nuanced character with plenty of scope for conflict. Which is exactly what you need for an antagonist! Thanks, Sarah. 🙂 Picking this particular set of questions helped, but I think I’d like to do another Beautiful People with Virik in the future. Just to make sure I know him as fully as I should. If you are at all unsure about knowing how he’d react, then I think that’s a good plan… Do you find when you write your characters, they sometimes take you by surprise in what they do and say? Funny you asked that. I was rewriting a scene from Chapter 22 this past weekend, and I learned something new about one of my supporting characters (not Virik). I had assumed he was the youngest in a family of four or five children; but during the scene I was revising, he tells Eva, “I might as well be dancing with my younger sister.” (*raises an eyebrow*) I guess he’s not the youngest in his family after all…? But that’s one instance where a character has surprised me. Virik… Gosh, I can’t remember if he’s said anything that has shocked or surprised me. I guess not then? This is a great questionnaire to help flesh out a character, I love your answers! I’m a huge sucker for great antagonists and Virik has definitely intrigued me, I think he would be a great antagonist! I actually usually end up liking the antagonist more than the protagonist xD I’m terrible. And I’m glad you liked the answers! If you found Virik intriguing, maybe I’m on the right track after all. I think Virik sounds like you’ve put a lot of thought into him. And he sounds like the type of antagonist that could e sympathised with, like underneath he could have been different. I would like to know what exactly he did to deserve his demotion. I think that’s the key to understanding him. Thanks, Phoenix! Yes, I agree that Virik could have been a very different “person” if life had turned out differently. Virik’s brother Milos and their mother have conflicted opinions about Virik, at best. Milos doesn’t like bearing the brunt of Virik’s vitriol (and honestly, who would? ), but he’s wise for his age and realizes where his brother’s anger is coming from. I don’t want to say he tolerates Virik’s behavior, but there’s not much he can do about his brother’s feelings (especially when his brother hates him and refuses to listen to him). I’m not as familiar with their mother yet (she doesn’t appear in TKC), so I’ll need to look into that at some point… But I imagine she must feel similarly torn about her oldest son. The father, however. He sees through Virik and knows what he really wants (to be next-in-line again). Leunyevar (the father) also views “kingship” not as a birth-given right (which is how Virik sees it), but as a privilege that can be taken away if an heir proves to be less than a model Fae citizen – which is what Virik has done, in Leunyevar’s eyes, and he’s not about to give it back to him. So, Leunyevar’s a little annoyed at his son’s persistence, and their relationship has become… strained, to say the least. No problem! If I recall, it was a good post. Oooh, that sounds good! I’ve found in some ways, it’s easier for me to get to know a character if I don’t know just what they think of themselves, but also what other people think of them. Sometimes, knowing both helps them feel more three-dimensional. I’ll have to look into the Avatar Airbender show. It sounds like something I might like. I did see parts of the movie (the one made by M. Night Shyamalan, right? ), but yeah, it was NOT a good movie. Terrible acting, if I remember correctly, but not a bad story by any means. Yeah, the acting was terrible, and there were quite a few things that were part of what made the show so much fun that were just…completely non-existent in the movie. The thing I remember the most was the character development. In the movie, not only was the acting bad, but the characters were just so…flat and boring, and they’re very much not flat and boring in the show. Virik has a neat backstory! I like it. It gives him this seed of bitterness that makes him lean toward the baddy side. I like how he has a bit of a good side too without us liking him too much. That’s the best balance to me for protagonists. Enough sympathy so we understand his motivation, but not too much so he doesn’t seem like a bad guy anymore. Best wishes writing him! Thank you, Tori! It seems like the “re-tooling” I’ve done for Virik’s character so far seems to be working. I just didn’t want him to be an overly arrogant, self-centered prince; and that’s unfortunately what he was when I wrote Draft #1. He’s still not quite where I want him to be character-wise in Draft #2, so hopefully I can remedy that during the third go-round. Oh my gosh those palace pictures are so pretty! I’d kill to live at Virik’s house. Aren’t they? 😀 It’s the perfect kind of palace for the Fei in this story world. “and, um, more clothes than the Prince. (*blushes*)” This cracked me up – I didn’t even notice the Prince’s garb until I read it. I want all of your characters houses, I think. Or I just want to live there. But back to the point, Virik’s character development sounds good to me! You said he isn’t a major antagonist, but how much impact does he have on the plot? I’m intrigued here. ” Yes, his mother. I need to spend more time considering their relationship (I haven’t done so only because Virik’s mother doesn’t appear in TKC), but Virik knows that his mother still loves him and will listen to him. ” Agreed – it is a rare person who doesn’t have SOMEONE who cares about them/they care about, even if it’s for selfish reasons. Even though I wasn’t a fan of Thor: The Dark World, I did like the nuanced relationships of Freya, Thor, and Loki, and how the former two both contributed to Loki’s villainy and hindered it with their feelings about one another. I feel like a good antagonist needs some love somewhere, because it makes us empathize (even if we shouldn’t), and it makes their “badness” worse because of the collateral. Would you ever consider doing a character interview for Virik? OK. I’m clearly missing out on something here. *lol* I’ll have to see if Avatar is available OnDemand from my cable company. I’m still going to do a post about the Fae kagenden (“treehouses”) at some point, btw. I just need some time to look for images that (sort of) fit the weirdness I see in my head. It’s hard to explain why Virik is only a minor antagonist without giving away too much of the plot. And I feel bad because I’ve said that a few times while responding to comments on this post… but there are certain things I just don’t want to give away! :S Plus, TKC is kind of a different kind of story, in that the primary antagonist is actually the protagonist. If Eva makes certain wrong decisions, she could very easily become “the bad guy.” So, while there are “external” antagonists, Eva really has to learn to overcome herself in order to achieve her goals. I like / agree with your Loki example. He isn’t a plain ol’ bad buy, but an antagonist with real, believable motivations for his actions – and love (or lack thereof) is one of them. You made perfect sense 🙂 – despite the fog! As someone who also often writes from the “antagonist” point of view, I get it 🙂 Half of my characters spend their time somewhere on the fence. Those photos are beauuutiful, btw! I’m glad you found reasons to like Virik as well as reasons not to. Like I’d said, I was afraid I had made him unsympathetic, so I’ve been trying to look at his character from a new angle, so to speak. So far, it seems like the new approach may be working… We’ll see once beta-reading time comes around.